This modern, recently refurbished and spacious hotel enjoys a quiet location with good views of the resort and clear sea. The resort has excellent sporting facilities. The hotel was kept very clean; there were always cleaning staff around. The food was some of the best I've seen for a buffet style - plenty of choice and not just chips and our visit to the Asia restaurant was very plesant even used the chop sticks! We had lunch in la pasta and the sports bar and both were good. The hotel is at the top of the resort and the views from our room (6th floor) were great. There were a few complaints by people that there was no beach but it does clearly say this in the brochure. Hotel staff were great always happy to help and smiling and the bar staff were very good even under pressure. The entertainment looked ok but we didnt really go to it. There is a good selection of sports etc and bikes. I would visit this hotel again but a bit later in the season as some of the older saga holiday makers were totaly ignorant pushing infront and barging you out of the way at meal times! The hotel was very clean with rooms cleaned every day and fresh towels provided when left in the bath. The food was lovely and you could upgrade from half board to AI for 20 euro ppppd if required. 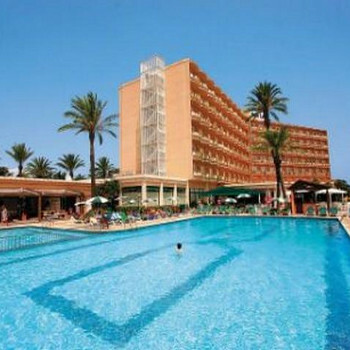 If planning to stay in resort this was a good option as there was various places to eat and drink not only in the San Luis hotel but you could also use the AI in S'Algar hotel on an evening and The Palmeras hotel. The hotel had very good sporting facilities which include tennis courts, football pitch, bowling green and mountain bikes, together with plenty of play areas for children. There is free wifi internet in the reception/lounge area if you take your own laptop. The evening entertainment was good with live acts 4 out of the 7 nights (dancing on the other 3 nights). This hotel is excellent for anyone seeking a quite holiday in a really nice hotel with good food. All staff were extremely friendly and helpful. We stayed in the Hotel Luis S'Algar. The cleanliness of the reception area was very good, the initial reaction to the bedroom and bathroom was good, but on closer inspection and as our 10 day stay progressed the cleaning was not apparant in our room. The bath didn't get cleaned once and towels were not changed daily or folded. The carpeted floor was not hovered. The view from our 6th floor room was breathtaking. The Hotel food was of a good standard, but by the end of the first week it was very repetative. There was always plenty to eat and the dishes were hot. Lunch times were a bit of a pain. There was a choice of the pasta bar by the pool, very limited choice on the all inclusive, sports bar a walk away from the hotel area where you could have a sandwich or roll or the main restaurant, which involved getting dressed. friendly but all other staff seemed fed up with us. The bar was very understaffed and getting a drink was tiresome. The location of the hotel was up on a small hill, a short work to the centre, the resort is small and very quiet and for us that was great. A mini trian run down to the centre on regular intervals in the evening but the walk was nice. We didn't join in the entertainment, but could here it from our room, it always finished at 11pm and didn't cause us any problems. We would not stay at this hotel again, because of the rules regarding the pool use. Children were not allowed to play with inflatables or balls in the pools, whilst danagerous games of volley ball and water polo were arranged which resulted in several sunbathers and other pool users being hurt. After complaints the ball used was changed to a softer one. My wife and I stayed here in September 2007 and what a superb holiday we had. The hotel is in the resort of S'Algar, a holiday-type resort, with only a handful of hotels, but plenty of holiday apartments and villas, most of which seemed to lay dormant as it was the end of the season. As other people have said, no there is not a beach at S'Algar, but that doesn't detract from what is a wonderful setting. There is a very small harbour, more like a jetty, and the coastline is very rocky albeit very picturesque. The hotel was spotlessly clean and although it was full of Saga holidaymakers, it was still a terrific hotel, with a tremendous 'Sports Zone' alongside the hotel. This consisted of a bowling green (the only one on the island), several tennis courts, artificial footy pitch, basketball/volleyball court, gym, sauna, putting green, driving range, putting green, petanque area, shooting and archery, and also mountain bike hire. All of the sports bar bowls, gym and mountain bikes were free for guests, although shooting and archery were limited to lunchtimes once or twice a week. The hotel itself has an outdoor swimming pool, with smaller paddling pool for the kiddies, and we found that there were always plenty of sunbeds free - just wish the weather could have been a little kinder! The food was plentiful and varied from day to day, with always a different 'dish of the day', while a chef was always in attendance cooking meat on a hotplate at breakfast and dinner. One thing that did surprise me - as a guest on half-board - was the fact that drinks seemed much more expensive in the dining room than at the bar. And a tip for water lovers - buy a large bottle, rather than two individual small ones, as it is much cheaper. The rooms were spacious, with plenty of room and were always well cleaned every day. Even the views from the balcony were great! What really made this resort stand out was the fact it was so quiet and peaceful. You could wander around the resort at any time of day and hardly see anyone. It was a ghost town really, but all the more better for it. For those who want a bit of life in the evenings, this is not the place for you as entertainment revolve around the hotels - there was only one bar in the place open at night, while in the daytime there were a couple of restaurants, a bakery (very good and cheap) and a shop, and a couple of Spa supermarkets, and that's about it. We love it at the St Luis and have been here 5 times. Reading other reviews makes me realise the importance of researching the destination, to see if it is for you first. St Luis/S'Algar can be summed up as a classy, quiet family orientated hotel/resort. It is very cosmopolitan and laid back, with few shops, and no harassment from vendors time share touts etc. There is no beach but, we've never found this a problem: there is access to a beach resort - Punta Prima (bus) and a nearby small sandy cove (walk), both of which add variety to just staying at the hotel/resort. The walk from the Las Palmeras apartments to the "town" in the evening is really beautiful. If you want a really quiet, peaceful, get away from it all holiday and feel that you are abroad, then this is for you. I wouldn't recommend it for those wanting action, bars, clubs and action 24/7, or wanting England in the Spanish sun. Every sympathy with Gavin from Ilford. We had been led to believe that there were 5 restaurants to choose from in the evening. There was one! The food quality degenerated during the fortnight we were there. We were led to believe that the ASIA restaurant formed part of the meals we could enjoy whilst there but you can only go once per stay and have a very limited (paupers) menu. The pasta restaurant shuts after lunchtime and when we pointed it out that it was stated as an evening restaurant - THEY REMOVED THE MENU!!! The staff were brusque, rude and treated all of those people on all inclusive basis as inferior - something like a gin and bitter lemon was refused because it formed a cocktail!!!! On the positive side, it was spotlessly clean and the rooms were lovely but the woeful entertainment and poor service and misleading descriptions just spoiled it for us. We met some absolutely lovely people and during the power cut (yes really) a sense of Dunkirk spirit prevailed (although staff made us pay for drinks because they were unable to serve draught beers due to lack of electricity and only bottle beer was available) but if it hadn't been for the people we met, we too would have asked to be moved. Hotel was kept spotlessly clean at all times. The food was plentiful and buffet style. Dishes were replenished quickly. We were AI and this allowed us to eat once during our visit to an Asian Fusion restaurant which was excellent. There was also a lunchtime pasta/pizza within hotel site which was very limited in choice - but nice for a change. There was also a sports bar where we had lunch a day - sandwiches or baguettes. All staff were generally helpful and courteous. Plenty of staff on bar duty during busy periods. Entertainment was pretty much usual stuff - a few games during the day (which we did not take part in). At night there were a couple of bands and a tribute band all of which were very good. Another night was dancing competition, bingo and a magician. We only saw one band and the tribute - both very good. Would visit the hotel again - nice pool, spacious rooms, nice public seating areas, no shortage of sunbeds, though hotel was not full. We decided to book the Hotel San Luis in S'Algar because of the wide range of activities and entertainment listed in the brochure as well as numerous restaurants to choose from. The truth was that some of the water sports such as snorkelling were not available at the time we travelled but this was not mentioned in the brochure. Daytime & Evening entertainment (when it happened) was woeful, and I mean it was worse than amateurish. One of the games played involved throwing wet sponges into a bucket balanced on a member of the Animation Team's head. A Karaoke night started almost an hour late and then we were limited to one disc containing Beatles tunes. The five or six restaurants advertised were not all open at the same time and most were limited. The Asian restaurant advertised was only available for one evening visit per stay and even then you were given a small "All-Inclusive" menu to choose from. This "family" hotel entertained about 80% "Saga" holidaymakers. Staff were surly and sometimes downright rude. We asked to be moved after the first week. As soon as I got to the hotel it looked so posh. the entrance is presented really well and it isn't that far away from the airport. The hotel staff are really friendly and are plesant to talk to. The rooms are very big and are very clean, it can be cleaned every day if you wanted it to. The views are spectactular if you are on the hillside view. The poolside is very clean and relaxing but the water is cold so give it until 1 o'clock to warm up! The food is absolutely delicious and if the meat you are eating isn't cooked the way you want it to be the chef will cook it more for you. All in all the only bad thing is if you can't speak much Spanish because all the staff are Spanish! we stayed at the hotel san luis. the entertainment was excellent for all the family. you could find an activity to do all day long. the food was also excellent. it is in a very quiet small resort but you leave your holiday feeling very relaxed. we will definetly be returning to this hotel. the hotel and entertainment staff were very friendly and always had a chat with you.